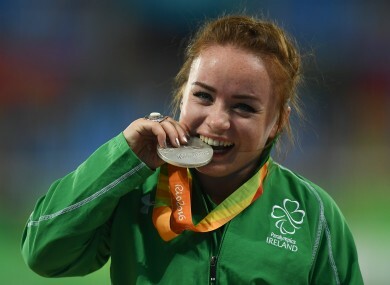 The sweet taste of success for Niamh McCarthy. UNDER THE SPOTLIGHT of the Olympic Stadium lights, Niamh McCarthy took a step back, walked away and found her coach. In the heat of the battle, she needed to rediscover her composure in the most testing of circumstances. It’s not that the Cork discus-thrower lacks confidence but she had just lost her focus for a split-second. A foul on her third throw during last night’s F41 final left her languishing in fifth. All of a sudden, her dream of a Paralympic medal was in danger of creeping away. So she had a quiet word with herself — ‘Jeez Niamh you need to cop on here’ — and searched for the familiar faces in the crowd. Dave Sweeney, her coach, was a calming influence. “He is the man,” McCarthy, 22, said afterwards, with a silver medal around her neck. “I’m not usually the type to go and see the coach after every throw but I just wanted to make sure I wasn’t missing anything because when you’re in there with everyone around you it’s easy to not notice the smaller things. And that’s what she did for throw five, catapulting herself into second position with an effort of 26.67 metres. That’s where she remained to claim her first Paralympic medal, sparking jubilant scenes amongst her family in the crowd. McCarthy grabbed the tricolour and celebrated with the Brazilian fans, much like Michael McKillop did last Sunday after storming to gold. “It was amazing, they don’t know who I am but they were pumped with me, I loved it like. It was the cherry on top I suppose,” she explained. “My mum was here today, she gave me a little wave. I kind of had to be like ‘ok, I have to compete in a minute, chill, think about the competition’. Earlier on Thursday, in the same stadium, McCarthy’s fellow Cork woman Orla Barry enjoyed similar success. One sport, two very different athletes, two silver medallists. Barry is a much quieter personality and goes about her business in an understated manner — but just the same there’s a steely determination and drive to an athlete who has enjoyed incredible success. What is it about Rebels and producing their best on the biggest stage? Already this summer we’ve had the O’Donovan brothers and Pat O’Leary make headlines from Rio and now this discus duo delivered to bring Ireland above the Paralympic medal target of eight. In doing so, Barry went one better than her bronze in London and added another medal to her growing collection, which also includes European gold. But, unlike the self-belief of McCarthy, doubts reverberated around Barry’s head in the week leading up to her final. Would she produce her best form, would she be able to throw over 30 metres? She didn’t need to worry. A third attempt of 30.06 secured her second place and with it a second Paralympic medal. A weight off Barry’s shoulders, but McCarthy embraces that pressure. “The hairs on my arm were going up, Orla’s success really spurred on. My preparations had just gone absolutely perfectly, I wouldn’t have changed one thing the last two months. Early on Friday morning, as the celebrations were no doubt only winding down here in Rio, Michael D Higgins offered his congratulations to Ireland’s latest Paralympic medallists on Twitter. A proud day for the athletes, their families, Ireland and Cork. Email “Rebels Abú! Cork room-mates share Paralympic glory on memorable Rio night ”. Feedback on “Rebels Abú! Cork room-mates share Paralympic glory on memorable Rio night ”.